Bannock is one of the unique and innovative restaurants in the Oliver & Bonacini portfolio, renowned in Canada and especially Ontario. 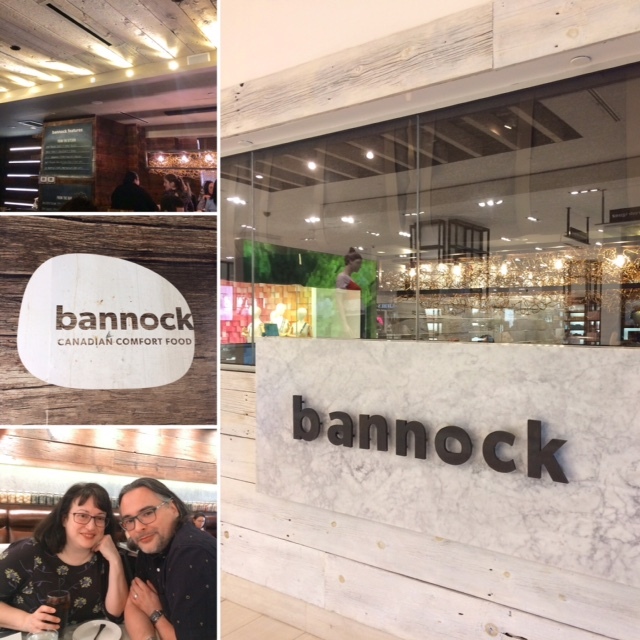 The creation of Peter Oliver and Michael Bonacini, Bannock is a Canadian comfort food restaurant and café enviably located in Hudson’s Bay flagship store in downtown Toronto. The café is a great place to grab a quick sandwich, salad, pastry or coffee but the restaurant, past the centrally located open kitchen, is the place to be. The beautifully designed space is stunning and lends a real Canadian feel with its sweeping ceiling of interlocking hemlock boards reclaimed from a 150-year-old wharf in Lake Ontario. 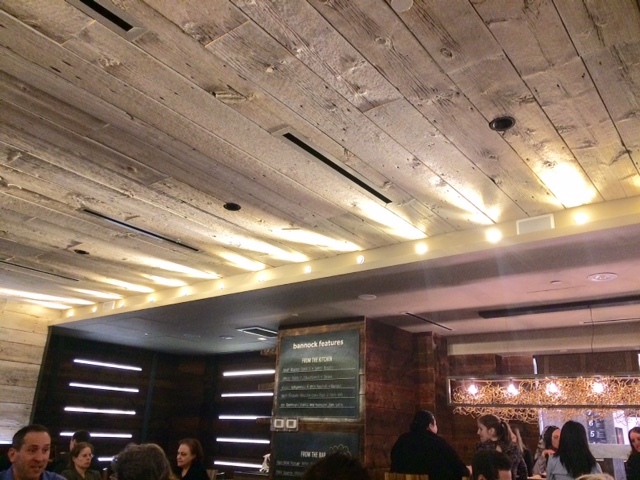 White washed pine, concrete imprinted with planks, banquettes, wooden chairs, marble tables, a communal table and atmospheric lighting all contribute to the modern Canadian aesthetic. However, it’s not all style over substance. Bannock offers Canadian comfort food at its best. 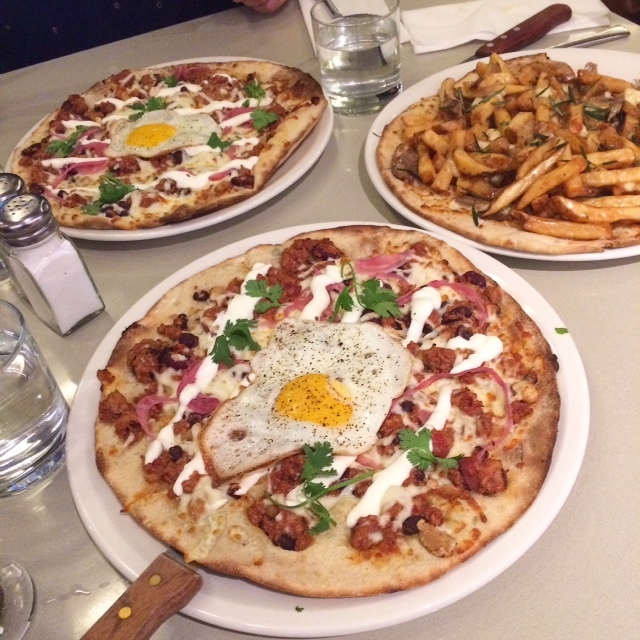 Although the restaurant is named after the traditional Scottish flatbread adapted by early Canadian settlers and indigenous peoples, the bread is their own take on bannock and is the inspiration for some of their menu items, such as the sandwiches and pizzas. 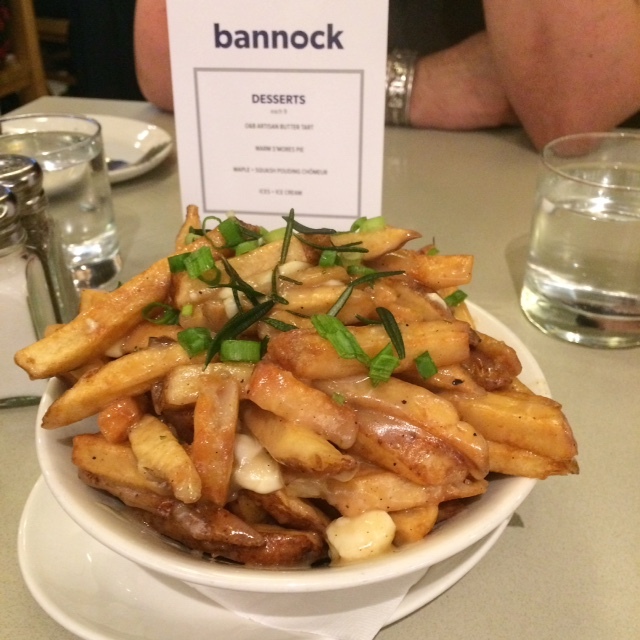 Paulo and I couldn’t pass up Bannock’s excellent poutine so we shared a portion as our starter. Made with skin-on fries from Yukon Gold potatoes smothered in artisanal cheese curds and chicken gravy, there was so much to love in this classic Canadian dish. A sprinkling of spring onions and rosemary added some colour and elevated the poutine to posh status. 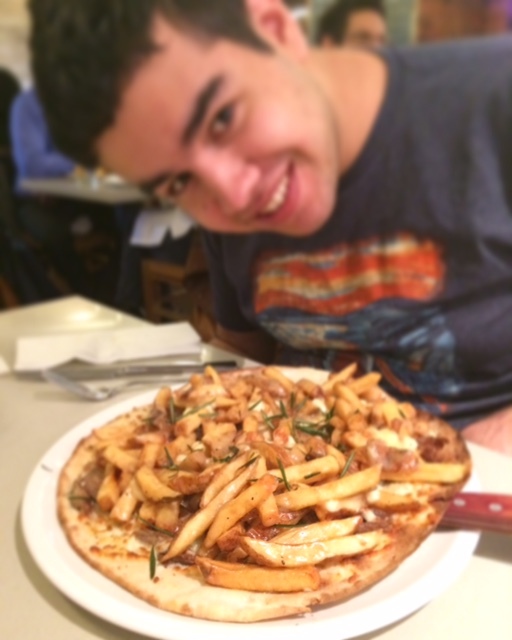 My son has been ordering the Roast Duck Poutine Pizza for at least five years now and we are always relieved to see it on the menu. Long may it continue! The pizza featured a thin bannock-type crust with enough “chew” in the thickness to give it substance. The dough was embedded with spring onions for extra flavour. My son didn’t mind the spring onions in the base but he did ask to skip the caramelised onions on top. I am certain the sweetness of the onions would have complemented the succulent shredded duck but to each his own. The crowning glory was Bannock’s magnificent poutine with its mound of tasty fries, squeaky cheese curds and mouth-watering gravy. 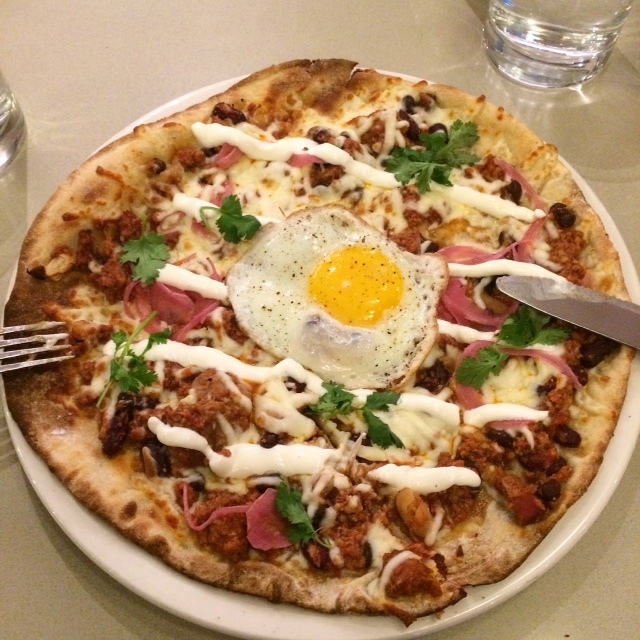 Paulo and I loved the sound of the Chef’s Feature Pizza on bannock crust, topped with chilli con carne, onions, cheese, coriander, sour cream and a fried egg for good measure! It sounded a bit insane but we went with it and we were very glad. It was absolutely delicious and we hope it becomes a permanent fixture on the menu. A visit to Bannock is always a must when we visit Toronto and it’s wonderful to see that the same level of impeccable food and friendly service is being maintained. We tend to go for lunch as it’s the perfect fuel for a day of sightseeing but I’d like to return in the evening. With cocktail names like Muskoka Mule, A Canadian In Mexico, Northern Light and Prairie Peach contributing to Bannock’s Canadiana theme, it’s the perfect excuse to return and linger over a leisurely dinner. 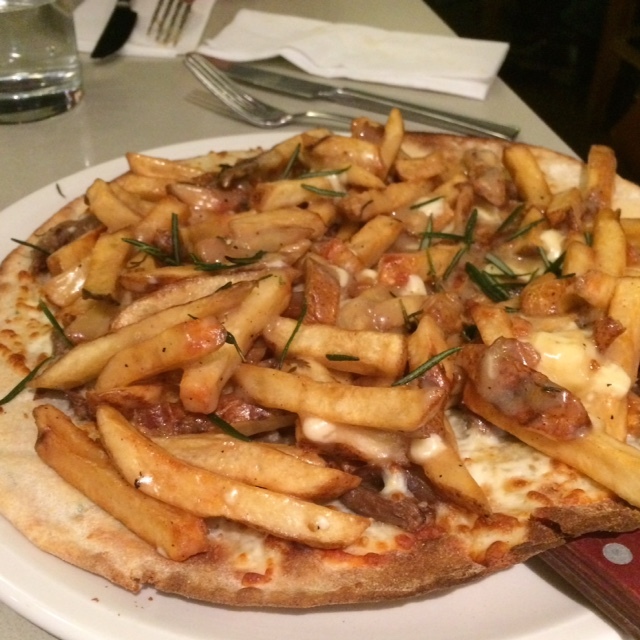 This entry was posted in Restaurants and tagged Bannock, Canada, Hudson's Bay, Michael Bonacini, Oliver & Bonacini, Ontario, Peter Oliver, poutine, roast duck poutine pizza, Toronto by One Two Culinary Stew. Bookmark the permalink.